Several buses en route to evacuate the sick and injured from two government-held villages in Syria’s Idlib province have been burned by rebels.The convoy was travelling to Foah and Kefraya, besieged by rebel fighters. Pro-government forces are demanding people be allowed to leave the mainly Shia villages in order for the evacuation of east Aleppo to restart. Thousands of people are waiting to leave in desperate conditions, reports say. Al-Qaeda gangs themselves provided video of the bus burning. The bus drivers were likely murdered which pretty much guarantees that no further buses will come or go. I doubt that this is a solely al-Qaeda induced incident. It seems to me that the certain U.S. forces (aka the CIA) are trying to prolong the removal of al-Qaeda from east-Aleppo for their own purpose. The CIA meanwhile continued to push a program that targeted Russia and its Syrian and Iranian allies — and helped shield Jabhat al-Nusra. There are several “western” groups that want to keep the evacuation stalled to continue their anti-Syrian, anti-Russian and anti-Iran agenda. The U.S. administration is miffed that it was kept out of the recent negotiations. It wants to demonstrate that any negotiations without its participation will not have any positive result. The hundreds of “last video from Aleppo” of “Bana” and other propaganda creatures claiming to be there look like a highly coordinated Information Warfare campaign. The “Stand with Aleppo” campaign in the U.S. was started and is propelled by a Democratic party operative who is also CEO of a public relations company and “strategic affairs consultant” in Chicago, Becky Carroll. Its aim is to escalated the situation in Syria. Meanwhile members of the Syrian opposition, or rather their “western” controllers in the CIA, are now emphasizing Iran, not Russia, as alleged spoiler in Syria. They claim, without any evidence, that Iran or its operatives held up the evacuations. This is part of a plan to preempt announced Trump policies of negotiating an end of the Syria conflict. The French president Hollande, despised by his people and with an approval rating between 4 and 6%, is calling for another UN Security Council vote over east-Aleppo. Such a vote, demanding UN observers for the evacuation, is intended to hold it up. Observers would need days to be in place and would lack any reasonable protection. Hollande also wants to provide food to the non-existing “civilians” in east-Aleppo while Reuters provides video showing that al-Qaeda and allies in east-Aleppo have horded enough food for years. The idea behind the UNSC resolution is to let it fail and to then go to the UN General Assembly which, under the right pressure, might allow a war by any nation against Syria. Earlier Hollande ordered the lights at the Eiffel tower to be turned off to mourn the liberation of Aleppo from Takfiris and to make it look like the flag of his defeated al-Qaeda friends. His sponsors in Qatar and Saudi Arabia will reward his principled stand. With the burning of the buses the evacuation agreement is dead and unlikely to be revived. 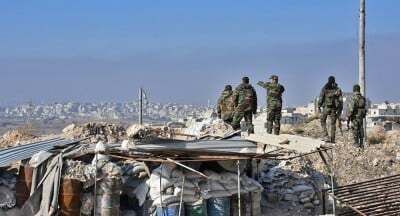 The Syrian army should tell al-Qaeda in Aleppo that there will be no longer be any ceasefire. It must make clear that they will now either be interned or killed. The final fighting should be over in a day or two. Meanwhile as much air support as possible should be provided to the defenders at Fu’a and Kafraya. The Russian military learned the hard way in Grozny that any ceasefire or pause you give to a mostly defeated enemy only helps the enemy and will, in the end, cost more lives on both sides. Putin and Lavrov have fallen for various negotiation scams with the U.S. that were designed to only hold back attacks on al-Qaeda and allies so that those forces could reorganize and resupply for renewed attacks on government held areas. Kerry’s promises to separate “moderates” from al-Qaeda in Syria was repeated over months until he finally claimed that the groups were too “marbled” to be taken apart. U.S. military attacks on Syrian government forces were launched to sabotage any agreement. Similar deceiving delaying tactics are now evident with the negotiated evacuation of east-Aleppo. Meanwhile the next al-Qaeda stronghold to be attacked by government forces in the governate and city of Idleb can be prepared for defense. With the Syrian army and its allies still busy in Aleppo new arms supplies can arrive in Idleb and new formations can be organized. The British government even sends more troops to train “moderate” al-Qaeda allies. It is time to end such sorry play. Clean up Aleppo already. Hollande, Samantha Power and other stooges will howl anyway – no matter how the final scene is done.